Let me show you a new way to stack deer hair. 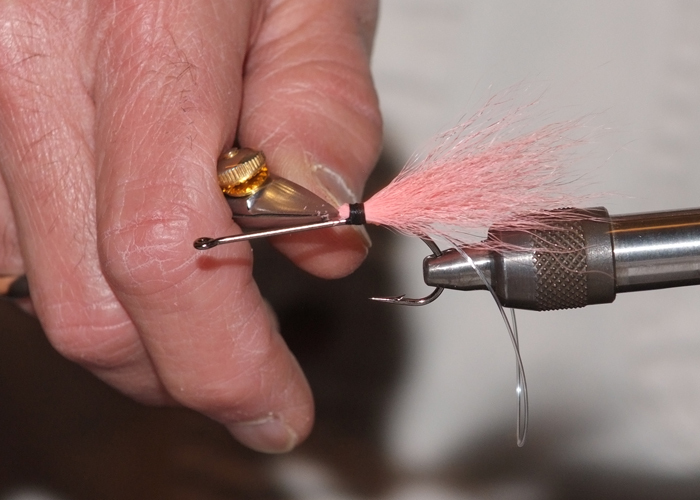 My video will teach you a new way to make the two most popular deer hair bugs, the Popper and Diver. I am self-taught and have developed my own techniques, which I want to pass on to you in this video. 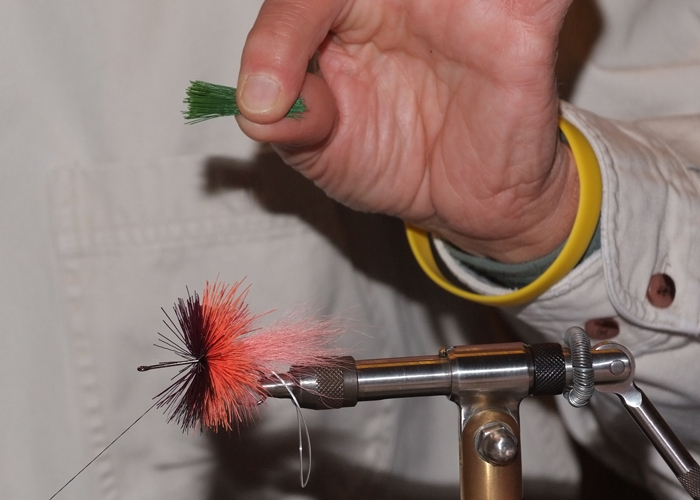 The bugs you will be able to tie after viewing the video will be balanced and the colors will be evenly distributed. You will also learn how to trim the hair with three special tools. Oh yes, they will also catch fish. This DVD covers the basics of my techniques, and there will be follow up videos with more advanced methods. The tying pictures below are NOT directly from the videos, but are examples of the demonstrations you will see. Mike, I just finished viewing the video. I think it is very well done and offers a lot of insight on stacking and packing deer hair. I think tyers of all levels can learn something from it. I particularly liked the multiple camera angles, the perspective from the tyer's side of the hook, made the steps being demonstrated more concrete. I will recommend this to my friends and anyone else who wants to learn about tying with deer hair. I look forward to your next production. I thought your video was GREAT!!! The camera angles and clarity were superb! I really enjoyed it and am looking forward to sitting down at the vise and wearing it out. Can't wait for the rest of them. Awesome! This DVD is a necessary component of any fly tier’s library! 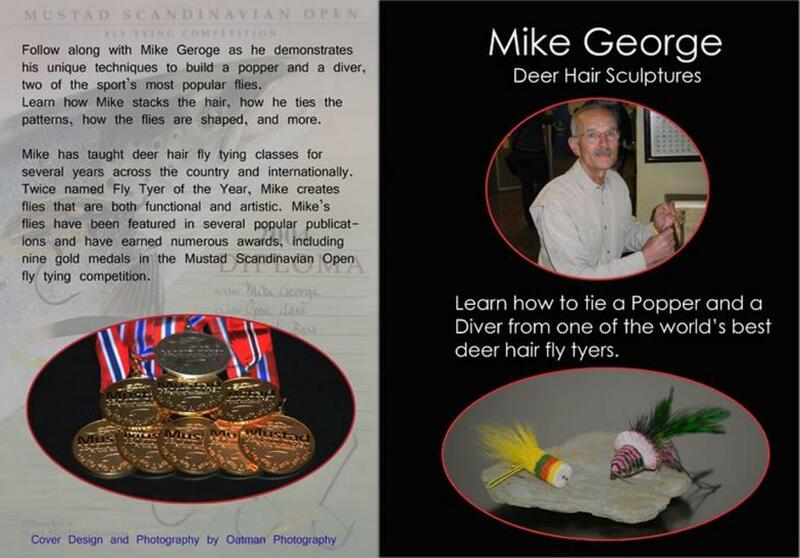 Mike George, a perennial Gold medal winner of the Mustad Scandinavian Open Fly Tying Competition, has produced a DVD like no other. 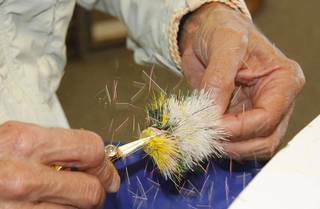 Mike’s techniques used in building and sculpting deer hair bugs is like no one else’s technique for utilizing and manipulating deer hair. 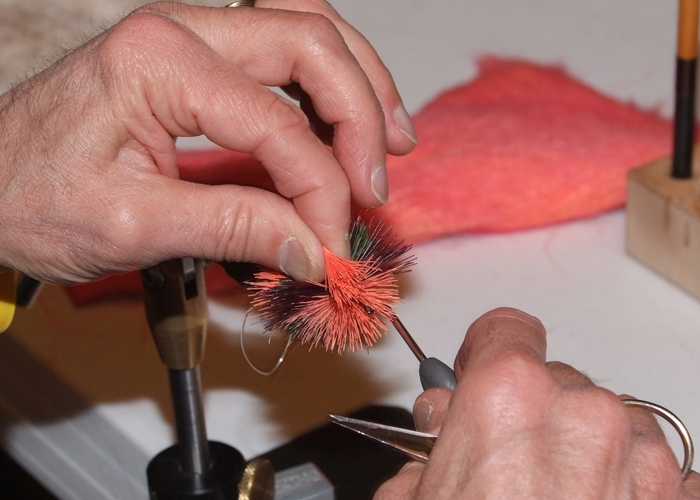 Mike’s approach to stacking rather than spinning deer hair offers the tier the ability to construct bugs with features that cannot be achieved by spinning the hair. The DVD includes a description of various tools that Mike uses, some of which are standards, the others of Mike’s own design for specific tasks. He also uses some standard tools in non-conventional ways, i.e. the hair stacker! None of the tools are expensive or difficult to obtain. Material selection is discussed as well as material preparation as the bugs are tied. This information is essential for successful bug construction. The lighting and camera work are second to none. Every step is seen from the tier’s perspective which is extremely important in an instructional DVD. The steps are well described and video close-ups of the steps are well presented. The audio is clear and clean with no extraneous sounds or other distractions. Mike is a gifted teacher and tying innovator. He is generous with his knowledge and open to questions, as evidenced by the inclusion of his contact information at the end of this DVD. I enthusiastically await his next DVD demonstrating other techniques developed by this gold medal winning tying master! Please see additional pages for latest projects and fishing adventures. 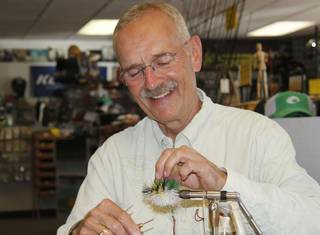 My 2017 tying schedule has been added to the Fly Tying Page. More bugs can be viewed on www.warmwaterflytyer.com. I am one of the featured tyers. ​This is a recent facebook conversation with a friend and customer who is proudly displaying a recently tied deer hair bug. Ricky, Yes sir! Your video is wonderful. It really helped that you mentioned using only 1 wrap on each section! Thanks for the help! Mike George Can I quote you on my web site? Ricky, Absolutely! This is the 5th one today! The hardest part is the trimming! Mike, I received your DVD and have played it. I have watched you tie at Sowbug and Southern Conclave on several occasions and hope to see you at 2015 Sowbug. I have always done 90% of my deer hair by spinning and have experienced some gaping in the hair. Your method of stacking results in a tighter bug and easier to work with the smaller clump of hair. I would strongly recommend to anyone interested in your method to purchase your DVD. It is great for referencing back to the correct method. Once someone gets home, without the DVD , if they are like me they forget what they saw at the shows. THE NEXT LEVEL VIDEO INFORMATION AND ORDERING BUTTON ARE LOCATED ON THE FLY TYING PAGE. TO ORDER THE FIRST VIDEO PLEASE SEE BELOW. TO ORDER THE FIRST DEER HAIR SCULPTURES VIDEO ABOVE USE THIS BUTTON. IT IS RECOMMENDED YOU VIEW THIS VIDEO BEFORE MOVING TO "THE NEXT LEVEL" AS TECHNIQUES DEMONSTRATED IN THIS VIDEO IN DETAIL WILL NOT BE REVISITED IN "THE NEXT LEVEL" VIDEO. Hi Mike, I've watched both of your videos several times. Very nice work! The thing that impressed me most about watching you tie was the precision that you can achieve when working with smaller hair clumps. It's rather surgical! I don't know if I could actually tape the hair clumps though. :-) Seriously, that's really impressive. I'm looking forward to practicing more of your techniques! Thanks for your wonderfully inspiring videos. Popper face template discussed in the first video.